Ideal for owners of motorhomes, caravans and four wheel drivers who spend extended time on the road and away from mains power, the new controllers deliver a comprehensive four-stage charging process and also allow the user to tailor settings to best suit requirements and battery type. There are many common features across the range which comprises SC220, SC245 and SC260 models, with the main difference between each being the number of AMPs each can accommodate from the solar panels they connect to. All three controllers are EMC-approved and allow the owner the versatility to set the charging profile to suit a variety of battery chemistry types: Wet, AGM or Gel. Alternatively, the two 5V 2.4A USB ports also allows for charging directly from the controller, an ideal feature to quickly power mobile phones, cameras and similar devices. Each controller is simple to operate courtesy of an easy-to-read, digital LCD screen that displays battery voltage, charging current, charging capacity, fault codes and more. To ensure safe and reliable operation, each controller is equipped with a low voltage disconnect function that protects the battery from damage from over charging. Other benefits of the controllers include a built-in temperature sensor that enables each unit to optimise charge performance and offer additional protection. An optional external temperature probe is also available at extra cost. Choosing from the three models will depend on the size and output of the solar panels to which the smart controllers will be attached – the SC220 model is designed for use with solar panels producing up to 20 Amps. The SC245 can handle solar panels with output of up to 45 Amps and is well suited to charge the larger deep cycle battery banks that are often found in motorhomes, house boats or remote cabins. Similarly the SC260 is designed for like applications but can handle a larger output of up to 60 Amps from the solar panels. The Smart Controllers are compact in design, the largest being 214mm x 129mm x 72 mm (depth) and come with integrated mounting brackets with predrilled holes for easy installation to a wide range of surfaces. 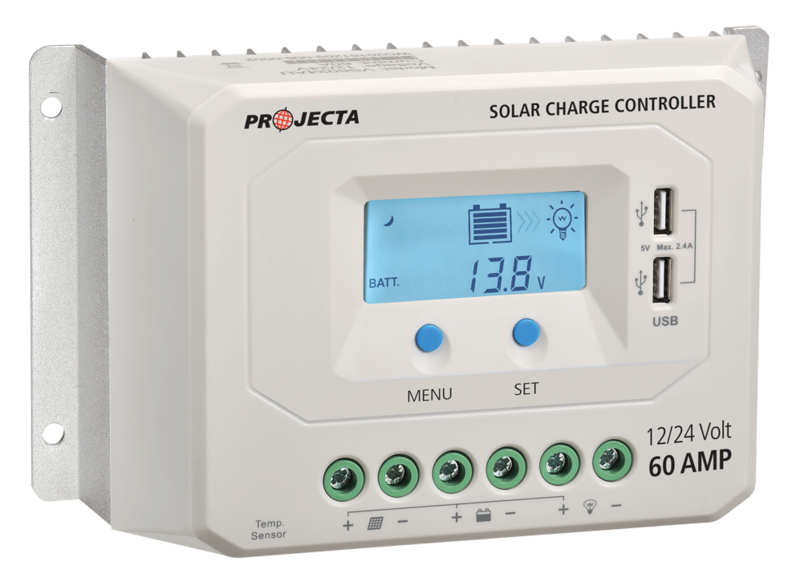 Projecta’s range of Smart Solar Controllers is available from leading automotive and camping outlets nation-wide.